Delmar Pub, 2004-08-30. Paperback. Good. Unknown, 2008-07-15. 6th. Paperback. Used:Good. Unknown, 2008-07-15. 6th. Paperback. Good. Delmar Pub, 2004-10-01. 5th Pkg. Plastic Comb. Used:Good. Delmar Thomson Learning, 2004-10. Plastic Comb. Good. 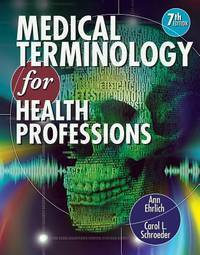 Ehrlich, Ann; Schroeder, Carol L.
Cengage Learning. SPIRAL-BOUND. 1111543275 New Textbook, Ships with Emailed Tracking from USA . New. Delmar Pub. Used - Acceptable. Ships from Reno, NV. Shows definite wear, and perhaps considerable marking on inside. 100% Money Back Guarantee. Shipped to over one million happy customers. Your purchase benefits world literacy! Delmar Cengage Learning, 2008-07-02. 6. Spiral-bound. Used:Good. Cengage Learning. SPIRAL-BOUND. 1435437683 Like New Condition. . Fine. Cengage Learning. SPIRAL-BOUND. 1435437683 New Condition. . New. Delmar Cengage Learning, 2012-03-05. 7. Spiral-bound. Used:Good. Delmar Cengage Learning, 2012-02-13. 7. Spiral-bound. Used:Good. Cengage Learning. SPIRAL-BOUND. 1111543275 Expedited shipping NOT available. Brand New. Exceptional customer service. Standard shipping is ground. All deliveries in 4-14 business days. . New. Cengage Learning, 2012-03-05. Spiral-bound. New. Brand New, Gift conditionWe Ship Every Day! Free Tracking Number Included! International Buyers Are Welcome! Satisfaction Guaranteed! Cengage Learning. SPIRAL-BOUND. 1401860265 New Inside and Outside. Clean and crisp pages w/no markings! Includes a sealed CD...You will be pleased. Excellent book! ( z1s175D ) Some minor shelf wear on cover. ** Fast Shipping** . New. Cengage Learning. SPIRAL-BOUND. 1133716660 New Condition. . New. Delmar Cengage Learning. PLASTIC COMB. 0766812979 New Condition. . New. Delmar Pub, 2003-09-30. Paperback. Good. Delmar Cengage Learning, 2008-07-02. 6th. Spiral-bound. Used:Good. Delmar Pub, 2003-10. Paperback. Good. Cengage Learning, 2012-02-13. Spiral-bound. Good. Delmar Pub, 2008-07-15. Paperback. Good. Delmar Cengage Learning, 2004-08-03. 5. Plastic Comb. Used:Good. Cengage Learning. SPIRAL-BOUND. 1111543275 US Edition Textbook, May Have Highlights, Notes and/or Underlining, BOOK ONLY-NO ACCESS CODE, NO CD, Ships with Emailed Tracking from USA . Good. Delmar Cengage Learning. SPIRAL-BOUND. 1418072524 US Edition Textbook, May Have Highlights, Notes and/or Underlining, BOOK ONLY-NO ACCESS CODE, NO CD, Ships with Emailed Tracking from USA . Good. Delmar Cengage Learning, 2000-06-16. 4. Plastic Comb. Used:Good. Cengage Learning. SPIRAL-BOUND. 1133716660 Like New Condition. . Fine. Delmar Cengage Learning. PLASTIC COMB. 0766812979 Like New Condition. . Fine. Delmar Pub. Paperback. POOR. Noticeably used book. Heavy wear to cover. Pages contain marginal notes, underlining, and or highlighting. Possible ex library copy, with all the markings/stickers of that library. Accessories such as CD, codes, toys, and dust jackets may not be included. Delmar Cengage Learning, 2008-07-02. Spiral-bound. Good. Cengage Learning 2008-07-01, 2008-07. Paperback. Good. Delmar Cengage Learning, 2004-08-03. Plastic Comb. Good. Delmar Thomson Learning, 2001-01-15. Plastic Comb. Good. Delmar Thomson Learning, 2001-01-15. 4th. Plastic Comb. Used:Good. Delmar Cengage Learning, 2012-03-05. Spiral-bound. Good. Cengage Learning. SPIRAL-BOUND. 1111543275 Item in good condition. Textbooks may not include supplemental items i.e. CDs, access codes etc... . Good. Delmar Thomson Learning. Plastic Comb. GOOD. Spine creases, wear to binding and pages from reading. May contain limited notes, underlining or highlighting that does affect the text. Possible ex library copy, thatâll have the markings and stickers associated from the library. Accessories such as CD, codes, toys, may not be included. Delmar Cengage Learning, 2012. Spiral-bound. Acceptable. Disclaimer:A readable copy. All pages are intact, and the cover is intact. Pages can include considerable notes-in pen or highlighter-but the notes cannot obscure the text. At ThriftBooks, our motto is: Read More, Spend Less.Dust jacket quality is not guaranteed. Delmar Cengage Learning. Used - Good. Ships from Reno, NV. Former Library book. Shows some signs of wear, and may have some markings on the inside. 100% Money Back Guarantee. Shipped to over one million happy customers. Your purchase benefits world literacy! Delmar Cengage Learning, 2008. Spiral-bound. Acceptable. Disclaimer:A readable copy. All pages are intact, and the cover is intact. Pages can include considerable notes-in pen or highlighter-but the notes cannot obscure the text. At ThriftBooks, our motto is: Read More, Spend Less.Dust jacket quality is not guaranteed. Delmar Cengage Learning. Plastic Comb. 0766812979 . Fine. 2000-06-16. 4. Delmar Cengage Learning, 2004-08-03. Plastic Comb. Good. Excellent customer service. Prompt Customer Service. Delmar Cengage Learning. Used - Very Good. Ships from the UK. Great condition for a used book! Minimal wear. 100% Money Back Guarantee. Your purchase also supports literacy charities. Cengage Learning. Spiral-bound. VERY GOOD. Light rubbing wear to cover, spine and page edges. Very minimal writing or notations in margins not affecting the text. Possible clean ex-library copy, with their stickers and or stamp(s).